The summit also named Hyderabad’s Hot 10 Startups who will receive mentorship and support from T-Hub, TiE, Hyderabad Angels and HYSEA member companies. As part of Hyderabad Software Enterprises Association’s (HYSEA) 26th annual summit, the organization gave away ‘HYSEA Software Product Awards’, recognizing interesting products and startups across categories. These awards were given away by Vice President of India Venkaiah Naidu. Two startups from Hyderabad-based startup engine T-Hub bagged awards. Aadhaar-based service provider Syntizen Technologies won the best software product - enterprise solutions award for its product e-COS. Founded by Vamsi Kotte and Siddharth K, e-COS is the startup’s Electronic Customer On-boarding Solution, which helps an organization to instantly onboard a customer with UIDAI ecosystem. It consists of e-KYC to Identity a Citizen, e-Sign to Digitally Sign Documents and e-NACH to create instant Standing Instructions for periodic debit of money. It makes the process paperless, presence-less and cashless. The problem they are trying to solve is that on-boarding customers today can take up to three days and includes various processes requiring the customer’s physical presence. Syntizen’s solution, the startup claims, reduces this time to 30 minutes and also greatly brings down the cost of on-boarding. 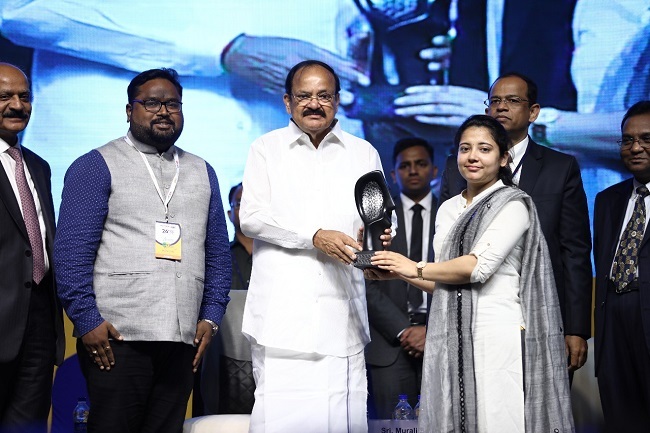 Under the social impact category of best software products, CarenGrow bagged the award for its CarenGrow School Health Platform. Run by Synvergent HealthConnect Private Limited, founded by Meghana Kambham, CarenGrow has built a platform, which does screenings, interventions and analyses behavioural changes in school students to ensure they inculcate healthy habits from a young age. The idea is to promote preventive healthcare. The idea behind Carengrow is that 80% of all diseases today are preventable. To solve the accessibility and affordability issues of healthcare check-ups, Meghana and her team built a technology platform that can be deployed in schools. It does screenings, interventions and analyses behavioural changes in children between the ages of 4 and 14. The other award winners included FlaashMob under the early-stage consumer solutions category; QuackQuack, under the late-stage consumer solutions category; UrbanDart under the early-stage enterprise solutions category, Skillsoft for their product Percipio - Intelligent Learning Platform under the established company category, Onward Health for their product Onward Assist under best technology innovation and Wozart Technologies’s Aura Switch under the best gadget category. The HYSEA Product Awards is a three-month process, with a 20-member planning team and a 45-member jury. Evaluations were held in two rounds, the first presentation round to the Jury of leading entrepreneurs, business leaders, Venture capitalists (VCs), and academicians was organized at IIIT Hyderabad, out of which finalists were chosen to showcase their products at the Annual Awards as part of the evaluation process. After the evaluation of showcase round, winners were chosen across the various categories. This year more than 140 products competed in the first round and 81 products were shortlisted for showcasing, of which eight products won. The design summit also included a special category of Awards called ‘Hyderabad’s Hot 10 Startups’. The winners of this category will receive mentorship, technology enablement, bootcamp opportunity, market and investor and access from T-Hub, TiE, Hyderabad Angels and HYSEA member companies. The Hy10 – Hyderabad’s top 10 startups this year are FlaashMob, KIOT Communications, Incessant technologies, Aayuv Technologies, UrbanDart Internet Solutions, SEEKNSHOP.IO, Acads360 India, Indriyn Data Analytics, Adonmo, and Thanos Technologies.